Mt. Shasta looms large over far Northern California. Just about any angle shows off the majestic mountain in all its 14,000-foot glory. But perhaps one of the best views of the mystical mountain is from nearby Heart Lake. A mere 45 minutes from your starting point in Redding, Heart Lake is a moderate hike that rewards you with postcard views. Nestled in the mountains just south of Lake Siskiyou, Heart Lake sits above Castle Lake. From the parking lot at Castle Lake, it’s a short, but moderate, 2-mile round trip hike to Heart Lake. The total elevation gain is 600 feet on the well-worn path. Heart Lake’s “point” frames Mt. 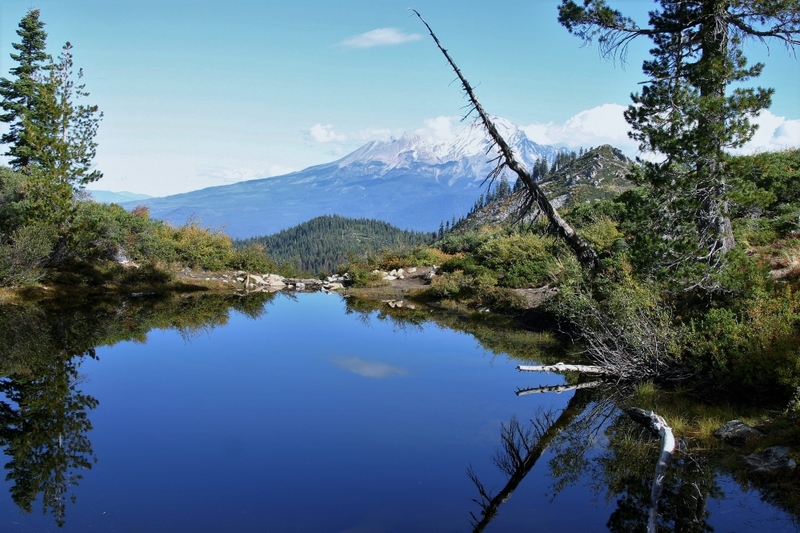 Shasta perfectly as the snow-capped mountain reflects gloriously in the placid waters of the tiny lake. The best time for hiking to Heart Lake is spring through fall, but the road to Castle Lake is plowed during the winter making it a snowshoer’s paradise. Castle Lake itself is a great alpine lake that offers the opportunity to swim, kayak, fish or Stand-Up Paddleboard. It’s a perfect place to take a quick dip after completing the hike to Heart Lake. The best time of day to climb to Heart Lake is early in the morning or late in the afternoon as the sun starts to set in the west and Mt. Shasta lights up with an amazing array of sunset colors. In addition to hiking to Heart Lake, hikers can also take spur trails that lead to amazing views of Lassen Peak and nearby Castle Crags. To get to the Castle Lake trailhead, take Interstate 5 north from Redding and exit at the central Mount Shasta exit and go left over the freeway. Follow Hatcher Lane and turn left on South Old Stage Road to WA Barr Road and follow the signs to Castle Lake. The trail to Heart Lake starts at Castle Lake and goes east from the parking lot, climbing above the eastern shore of Castle Lake.